It is nice to see pre-war Glads getting such comprehensive coverage. Colourful squadron markings over a silver finish will make a pleasant change to the normal run of camouflaged Gladiators. 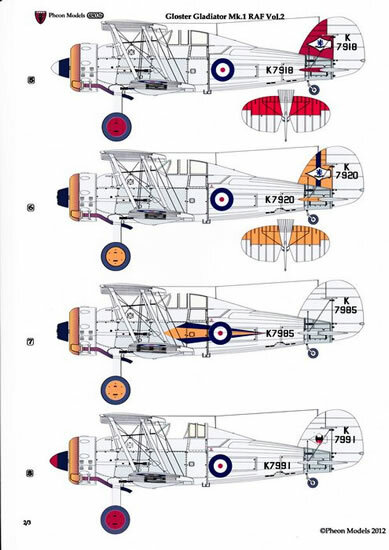 The Gladiator was the last British biplane fighter and the first fighter with an enclosed cockpit. It entered service with No 72 Squadron, at Tangmere, in February 1937. Despite being virtually obsolete out the outset (Hurricane deliveries started before the end of 1937), it enjoyed a distinguished wartime career and was also one of Britain's biggest pre-war export successes, seeing service in Belgium, China, Egypt, Finland, Free France, Greece, Iraq, Ireland, Latvia, Lithuania, Norway, Portugal, South Africa and Sweden. The last Gladiator was produced in late 1938; a production run of only about two years, so it was something of a stop-gap measure before the new generation of monoplanes. 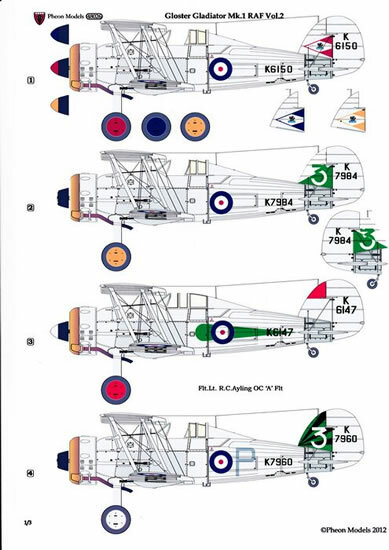 These sets are Pheon Model’s first release of decals for a non-WWI subject and they follow Pheon’s philosophy of providing modellers a greater selection than most other after-market manufacturers, combined with top quality printing by Fantasy Printshop (UK) and full colour artwork and decal placement guides on glossy card. 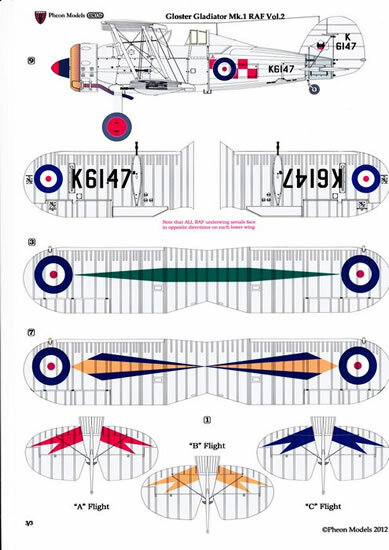 All coloured decals are backed with a white undercoat to ensure the colour is retained over a dark fuselage. 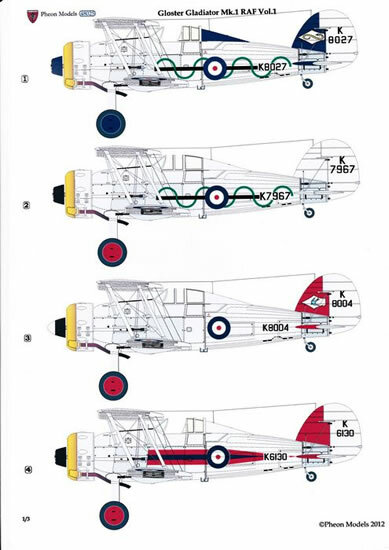 There were three basic Gladiator marks; the Mk.I, the Mk.II and the Sea Gladiator – note these decals are all for the Mk.I. 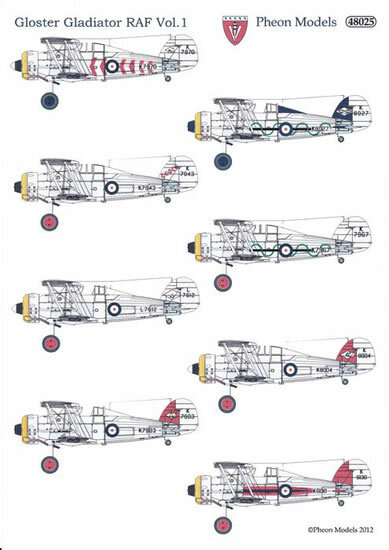 The Gloster Gladiator has been kitted by Inpact/Pyro/Lifelike/Lindberg many years ago, but Roden’s Gloster Gladiator is probably superior and still readily available. Roden make two that would be suitable: #408 Mk.I and #438 “Meteorological Reconnaissance & Foreign Service”. Service details of the six aircraft covered by this set are rather brief in Pheon’s instructions so the following details may be of interest. 1. Gladiator Mk.l G.30 of 1ere Escadrille de Chase (Le Comete) of l'Aviation Militaire Belge. Belgium had ordered 22 Gladiator Is during the summer of 1937, with delivery commencing in September. By the time Germany attacked Belgium on 10 May 1940 the 15 still in operation were all lost. 2. Gladiator Mk.l, 2909 of the 29s Fighter Squadron, Chinese Air Force' flown by Maj. 'John' Won Pan-Yang, June 1938. In October 1937, the Chinese Government ordered 36 Gladiator Is to replace their aging Boeing 281 (P-26 ‘Peashooter’) fighters. The Gladiators made their combat debut on 24 February 1938 when the seaplane carriers Notoro and Kinugasa Maru attacked Nan Hsiung with 13 Type 95 (E8N) seaplanes. The Gladiators served until December 1939, when the last aircraft was shot down. Wong was born in Seattle to Chinese immigrant parents. He obtained a private pilot's license at the Portland Flying School, Oregon, and went to China in 1932 to join the Guangdong (Cantonese) Provincial Air Force. Later he became commanding officer of the 17th Pursuit Squadron of the 5th Pursuit Group. While flying the Boeing 281 Wong Pan-Yang scored 3 victories (plus 3 shared) then a single victory flying this Gladiator (a G3M ‘Nell’ bomber which exploded in dramatic fashion after Wong hit its external bomb load) plus 3 shared. Surviving the war, he returned to the US. 3. Gladiator Mk.l, 423 of the Norwegian Army Air Service' delivered in August 1937. Twelve Gladiators were delivered to the Norwegian Army Air Force in the summer of 1938 but only seven were serviceable when Norway was invaded on 9 April 1940. This aircraft was the sole survivor of the initial attack but it was irretrievably damaged on 21 April when it struck the tops of a line of trees. 4. 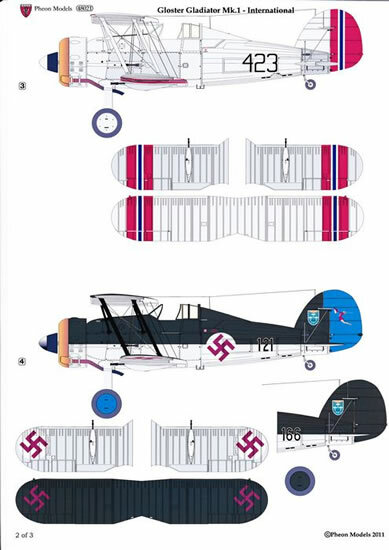 Gladiator Mk.l, 121 of 1st Fighter squadron of the Latvian Aviation Regiment, 1938 and 166 of the 2nd Fighter Squadron, 1938. 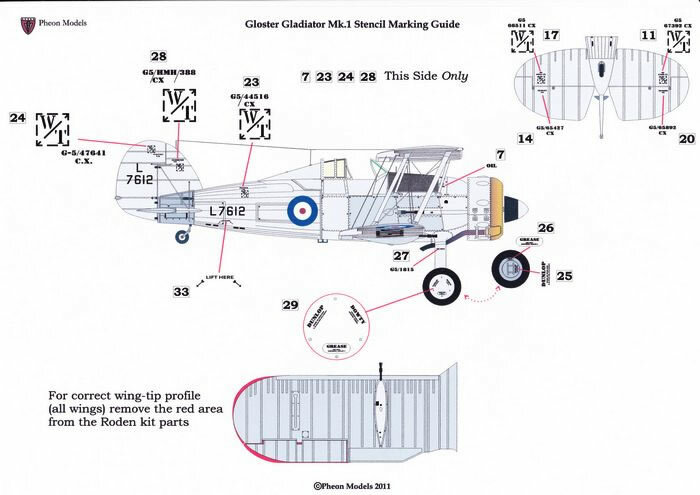 Latvia’s order for 26 Mk.I Gladiators in May 1937 was Gloster's first export contract. 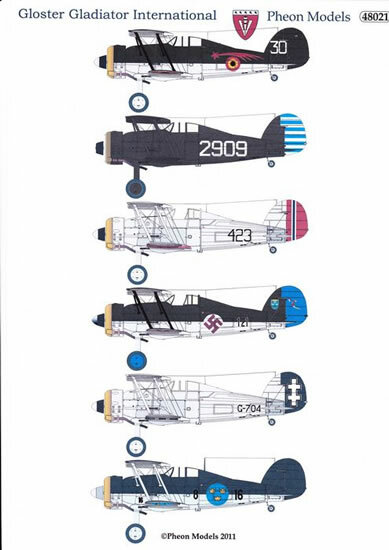 They were delivered between August and November 1937 and were formed into two squadrons for the defence of Riga. After Latvia was annexed by the Soviet Union in July 1940 the surviving Gladiators, about 20, were taken over by the Soviet Red Air Force (VVS). 5. Gladiator Mk.l, G-704 of 5 Eskadrilia, ll Nailintuva Grupe of the Lithuanian Air Force, Vilnius, 1938. Lithuania ordered 14 Gladiators shortly after its neighbour Latvia, and these had been delivered by November 1937, based at Vilnius and Kaunas. When the Russians invaded they captured most of the Lithuanian Air Force on the ground and subsequently impressed twelve Gladiators into service. At least one of these Gladiators is (G-709) is known to have been subsequently captured and used by the Germans. 6. 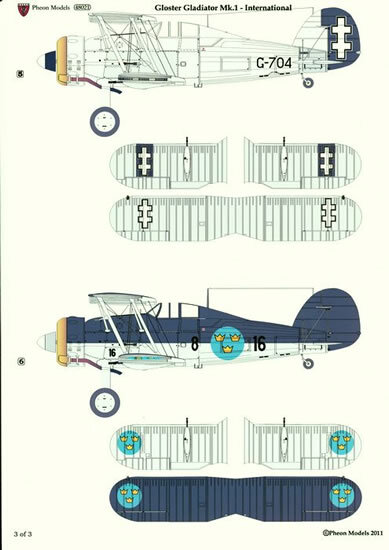 Gladiator Mk.l (known as the J.8 in Swedish Service) Flottilj 8-16, Barkarby, 1939. Sweden received 37 Mk I and 18 Mk II aircraft and some of these saw in action with the Finns from January 1940 against Russian forces. F8-16 was destroyed in a crash in Dec 1941. Swedish Gladiators were retired in 1947. It needs to be pointed out that apart from the Chinese option all the other markings in #48021 are similar or identical to options in the Roden #438 “Meteorological Reconnaissance & Foreign Service”kit which has decals for 9 aircraft: two in RAF meteorological flights, Lithuania, Russia (ex-Lithuanian), Norway, Sweden, Latvia, Belgium and Luftwaffe service. 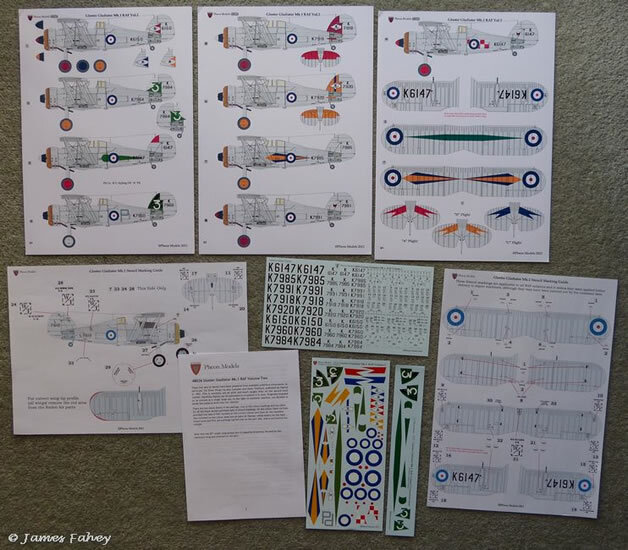 On the plus side, Pheon’s decals include a comprehensive set of stencils for wings, tailplane, fuselage and wheels; and Pheon’s decals are very excellent quality whereas Roden’s decals have a reputation for being difficult to work with. 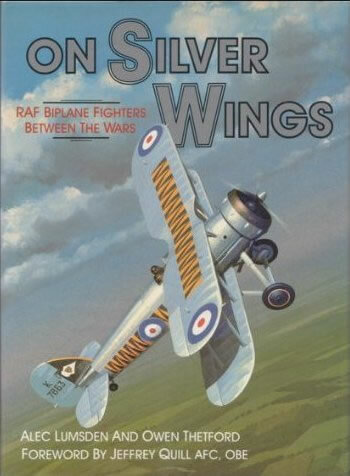 Both RAF sets are solely for pre-war Mk.I Gladiators in silver finish, drawing particularly on Alec Lumsden and Owen Thetford’s book 'On Silver Wings' which was published by Qsprey in 1993. Unfortunately this book is no longer in print and is much sought after on the second hand market. 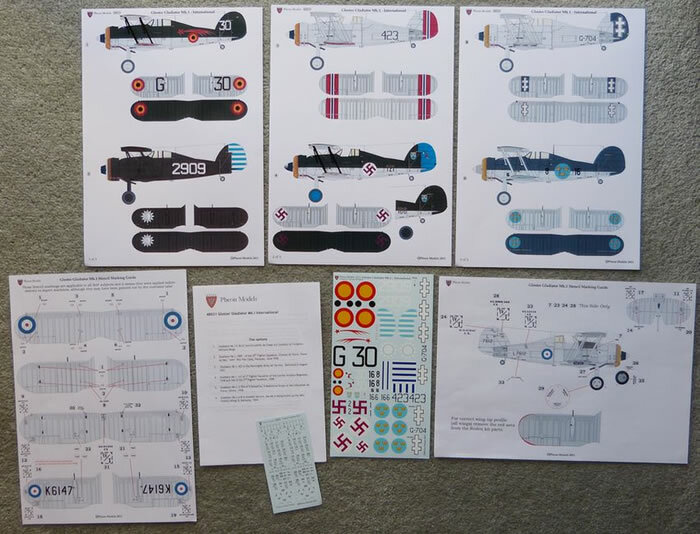 There are two decal sheets in each set, one of full-colour markings and the other for all the black serials and three sets of stencil markings. 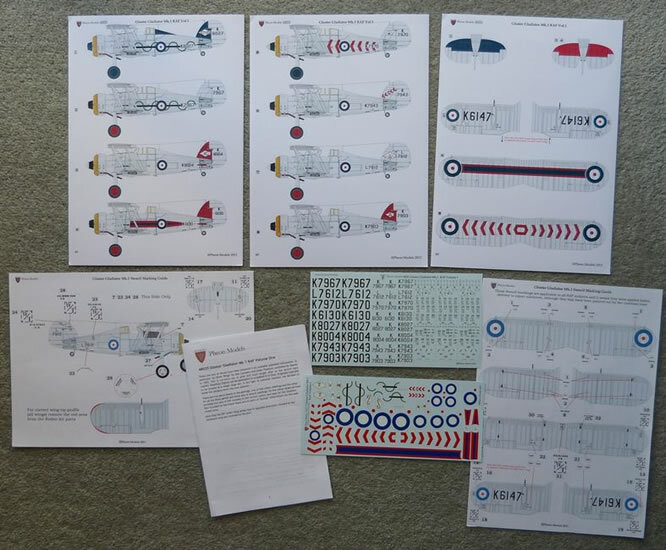 The stencils are very extensive with two A4 pages of instructions devoted to their placement. There are enough roundels for two models and six pairs of 'Dunlop' white letters for the main wheel tyres. Gladiators formed the equipment of more than 30 RAF squadrons or other front line units, both at home and particularly overseas. 1. K 8027 87 Sqn. Debden October 1937. ‘C’ Flight Commander’s aircraft. 2. K7967, 'A' Flight, 87 Sqn. Debden October 1937. This is supplied as an alternative to the first profile; less colourful but representative of a "rank and file" Gladiator. 3. K8004, 72 Sqn. Church Fenton 1938. 'A' Flight commander’s aircraft. The flight commander's red fin marking may have been accompanied by red tailplanes. Other flight machines carried the red colouring only on the wheel covers. 4. K613O, 72 Sqn. Church Fenton, Yorkshire 1937. 'A' Flight commander’s aircraft. 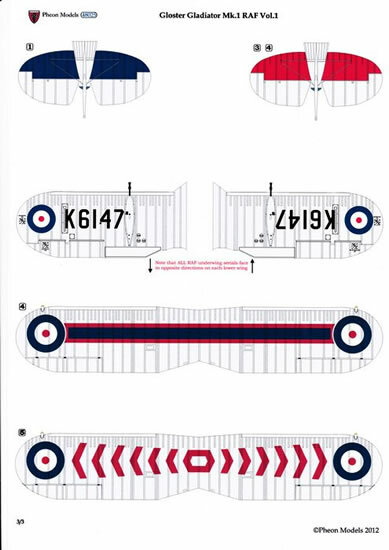 72 Squadron’s Gladiators left in May 1939 to form 112 Squadron, based on HMS Argus. 5. K797O, 'C' Flight, 65 Sqn. 1938. Pheon note that 65 Squadron’s chevron markings for the Gladiator are not based on any photographic evidence but on a description that the markings were worn in a similar fashion to the squadron's previous Gauntlets. 6. K7943, 65 Sqn. C.O. 's aircraft, Hornchurch 1937. This one is supported by photographic evidence. 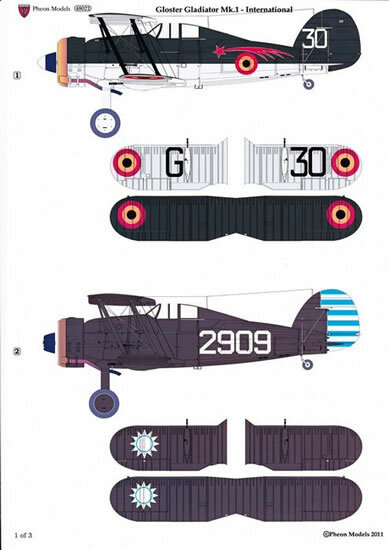 Squadron markings were toned down in early 1938, generally being limited to the squadron badge on the fin in a white Fighter Squadron arrowhead. 7. L7612,'A' Flight, 33 Sqn., lsmailia, Egypt, Alarch 1938. 8. K7903, 'A' Flight Commander, 80 Squadron, lsmailia, Egypt, 1938. 1. K6150, ‘A’ Flight, 3 (F) Sqn. Flt.Sgt. Lomas, Kenley,. January I938. 2. K7984, ‘8’ Flight, 3 (F) Sqn. Kenley 1938. 3. K6147, 3 (F) Sqn., Kenley 1937. 'C' Flight commander’s aircraft. 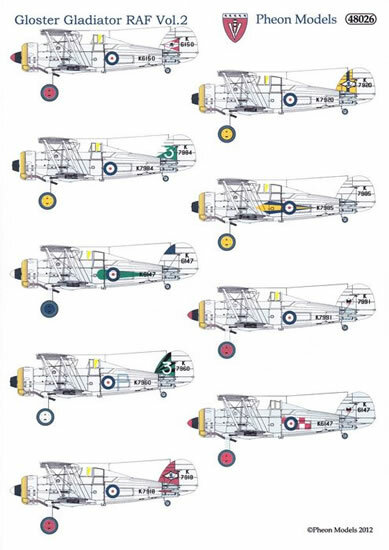 Another variation on 3 (F) squadron's markings. 4. K796A, 3 (F) Sqn. Sqn.Ldr. H.L.P. Lester, Kenley 1938. 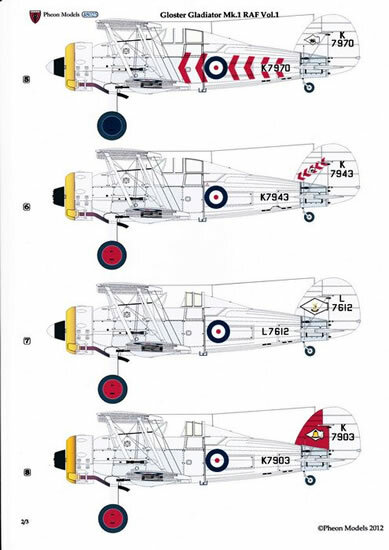 Probably the final variation of the “silver” era markings for 3(F) squadron. Lester’s aircraft carried the squadron number over three black “rays”. 6. K7920, ‘8’ Flight, 54 Sqn. 1938. The presence of the yellow tailplane colour is conjectural, as is the colour of the blue vertical stripe. 7. K7985, ‘C’ Flight, 73 Sqn, Debden 1937. This aircraft was flown by the Kiwi WW2 ace Cobber Kain at the 1937 Hendon Air Pageant, and the Shuttleworth Gladiator was finished in the markings of this aircraft when it was repainted in 2007. 9. R6147, 'A' Flight 56 Sqn, North Weald 1938. This option is not supported by photographs, but it is believed that the Gladiator did carry the famous 56 Sqn. red and white checkerboard on the fuselage sides for a time, at least. 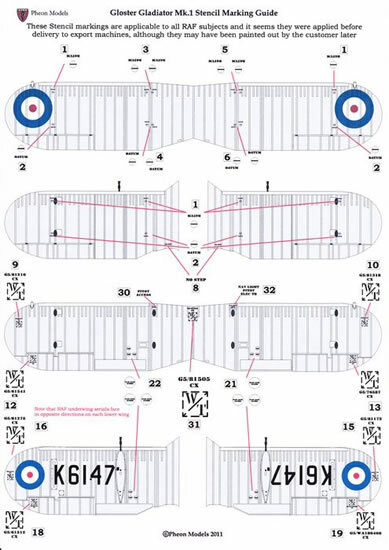 Many of the international Gladiator markings in #48021 have already been covered by kit & after-market decal manufacturers but Pheon’s offering stands out with its extensive stencilling details and decal quality which is top notch. The two ‘silver wings’ sets are very colourful and will set your Gladiator apart from all the drab camo ones normally seen.